The arts scene in Colorado ski resort Telluride hasn’t replaced its après-ski party scene, but for some visitors it could usurp the actual skiing instead. “You either come home from your day on the mountain, go to the bar, take a nap and then go to the galleries, or you don’t ski at all – you just come for the galleries,” says Kate Jones, executive director of not-for-profit Telluride Arts District. It’s a big call for a place that Condé Nast Traveler’s readers voted America’s Best Ski Resort in 2014. But for many skiers and snowboarders, the collision of world-class ski terrain with pulsating cultural scene could be a deal breaker. The petite mountain town in south-west Colorado houses 20 galleries in a two-and-a-half square-kilometre arts district, also home to a variety of creative disciplines and disciples from film, theatre, dance and music. The town’s Art Walk is an après highlight: stroll around the galleries, meet the artists and see a wide spectrum of styles from very contemporary works at Gallery 81435 to plein-air landscapes at Oh-Be-Joyful Gallery. While Telluride’s film scene doesn’t quite get the press of Sundance, it is renowned for its work in the Mountain Film genre, with local filmmakers such as Ben Knight and David Holbrooke emerging into the big time. So why is Telluride such an incubator for artists? The steel and glass entrance to the Museum in the Clouds, located 2181 metres above sea level, is perched atop an old fort that now houses works of art, installations and objects on the theme of ‘rock’. 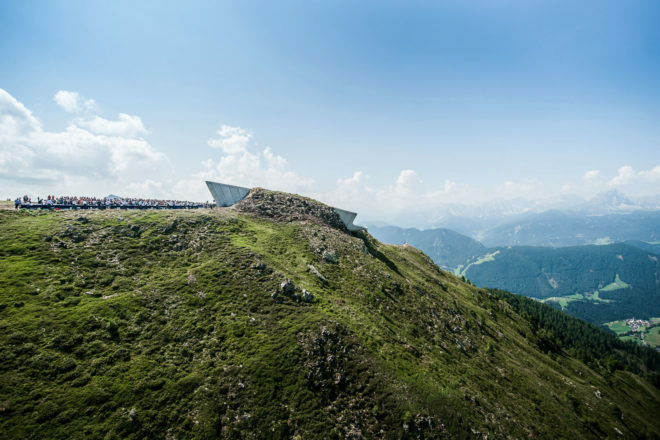 This property is part of mountaineer Reinhold Messner’s Messner Mountain Museum project that also includes the austere Zaha Hadid-designed MMM Corones (pictured right), which looks out over the South Tyrol region. Now in its seventh year, Art Over the Mountain Tops turns Courchevel into an open-air museum, with art installations scattered throughout the town and ski resort. This year’s artists are sculptor Richard Orlinski and American street artist JonOne, whose exuberantly colourful creations can be found on the walls of buildings and ski lift base stations. Located in the Swiss ski town of Davos, the modernist Kirchner Museum Davos celebrates the life and works of the German-born artist Ernst Ludwig Kirchner, who lived and died here. The collection includes numerous important canvases by the artist, whose art was denounced by the Nazis as degenerate. Cultural tourism in Aspen is rivalling ski tourism since the opening of the striking Aspen Art Museum. Museum director Heidi Zuckerman says the arts in Aspen is a powerful magnet for crowds in its own right, particularly during summer’s Artcrush event. And the roof-deck restaurant is the place for après with live music, a sculpture garden and commanding views of Ajax Mountain.